Not everybody can be the star: to paraphrase Caddyshack, the world needs henchmen, too. as a purely chaotic force of nature, the Joker is really anything but. He's a master planner, a man with so many plans in place that he merely fakes the chaos by being able to fall back to a contingency at any moment. For instance, in the original Arkham Asylum, Joker takes over the madhouse, but he does it with the help of his goons. Why were all these guys - who weren't insane, mind you, just normal criminals - at the Asylum in the first place? Why, because of a fire at Blackgate prison that forced them to be evacuated. Fortuitous timing? No, careful planning. Anyway, Series 3 of DC Direct's Arkham City toys is now out, and features a Clown Thug so your Batman can have somebody to fight. The Thug was sculpted by Steve Kiwus, and the details are great. His tank top clings to his prison-chiseled physique like it's been sprayed with a hose, but his pants are thick enough that they look like they belonged to a bomb disposal tech. Seriously, the pants themselves have a chunky, quilted pattern to them, and then there are thick belts and straps running all over them. It's nicely sculpted, but what was going through the game designers' heads when they made it? The goon has his hands and forearms wrapped for protection, and only laced his boots up part way. Either because he can't reach, or for speed while dressing. The Clown Thug is completely bald - beneath his mask, anyway. He's doesn't just have his face painted, like the Arkham Asylum goons, he's managed to scrounge up some facial concealment. The (non-removable) mask has two streaks over the eyes, a bulbous nose and a very wide smile. There are sculpted tufts of hair framing the face, as well. swivel/hinge shoulders, hinged elbows, swivel forearms, swivel waist, T-crotch, swivel thighs and shins. Why no knees? It's weird. His legs are spread and slightly bent, giving that same sort of pose that all the MO2K figures had, and without knees you can't straighten him out. The shoulders come out of the torso at a slightly forward angle, rather than sticking straight out to the sides. That's unusual, but it serves a purpose: namely, it makes him look more threatening when he's brandishing his weapon. Whichever weapon that is. See, DCD did something with this figure that they haven't done in several years: released a variant. In a case of 10 figures, there are two Batmens, two Azraels, two Penguins, two Ra's al Ghuls, and one each of the two Clown Thug variants. 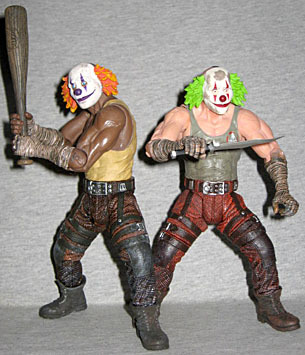 One of them is a black man, with a yellow shirt, brown pants, and purple stripes and orange hair on his mask; the other is a white man with a grey shirt, red pants, and red stripes, green hair and dirt stains on his mask. Despite being applied to identical sculpts, the paint makes these two figures look different enough even when they're standing next to one another. Anyway, Mr. Orange gets a big ol' baseball bat (a "Gothamville Sluggo" brand), while Mr. Green comes with a gigantic knife. A gigantic knife that got warped in the package, so now it looks like some kind of specialized curved blade. The Clown Thugs are good fun. They're well-made, fun to play with, and the variant paint schemes make it worth buying multiples. You can't just have Batman beating up the big villains all the time, can you? No, you need some nameless goons to throw at him first.